Heritage wedding car hire offers a completely flexible way to hire some of the most beautiful and elegant cars for your wedding day, we offer an open ended ‘at your disposal’ service. We will collect you from your home and take you on to the ceremony venue, thereafter with champagne in hand, onwards to the reception venue, we also offer plenty of time for photographs with the cars. After your wedding breakfast, we can arrange to take you back to your home, or your hotel or airport. We can even collect your suitcases for you. We guarantee glamorous travel, to suit the grandest of weddings. Our hire includes for White or Ivory ribbons on the cars, we can also arrange colour matching and printed ribbons. We do absolutely everything we can to help make your day perfect. 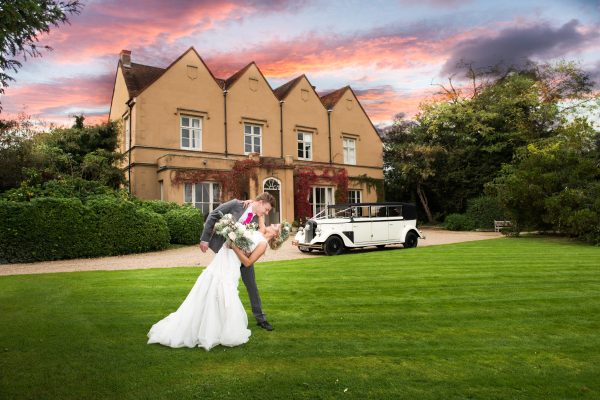 We will only undertake one wedding per day – we will never rush you, we are quite literally entirely at your disposal. Multi hire discounts are automatically applied when you book more than one car for the same wedding. Our car hire allows you to travel in style, your chauffeur will guarantee your arrival with the elegance that befits the occasion, we will ensure you arrive, with perfect timing, to be greeted by your brides maids. You can decide to have the car roof up or down (weather permitting) at any time. We will, if requested, tie on our traditional tin cans and fix the ‘just married’ sign to the car – once again, we are entirely at your disposal, we will only leave when we know you are happy. We genuinely do care about your wedding day, we do everything we can to ensure your cars are immaculately clean, perfectly presented and ready in all respects to serve you and your guests. We are always happy to add your own personal touch, just ask us and if it's possible, we will do our utmost to ensure that it happens. Due to our planned relocation in late 2019, we will no longer be able to undertake bookings that include locations west of the Dartford crossing, or south of Tonbridge. Your photographer will want to take plenty of pictures of you with the cars, we will help in any way we can – if you want anything ‘special’ just let us know. Above all – you can rest assured that we really do mean it when we say that your wedding day is as important to us as it is to you. Fully insured including public liability, registered with the Dept of Trade. Professional, licensed chauffeurs.